The sun is out, the sky is blue ...... there's a song in there somewhere ..... and the birds in my garden are busy building their nests. This morning I spotted the tiniest wren with a beak so full the poor thing could hardly move and at this time of year I do like to do my bit to help the birds make a lovely soft nest for their chicks so when I brush my animals, I carefully put the soft fur from the brush out on the gate post by the food I put out for them. 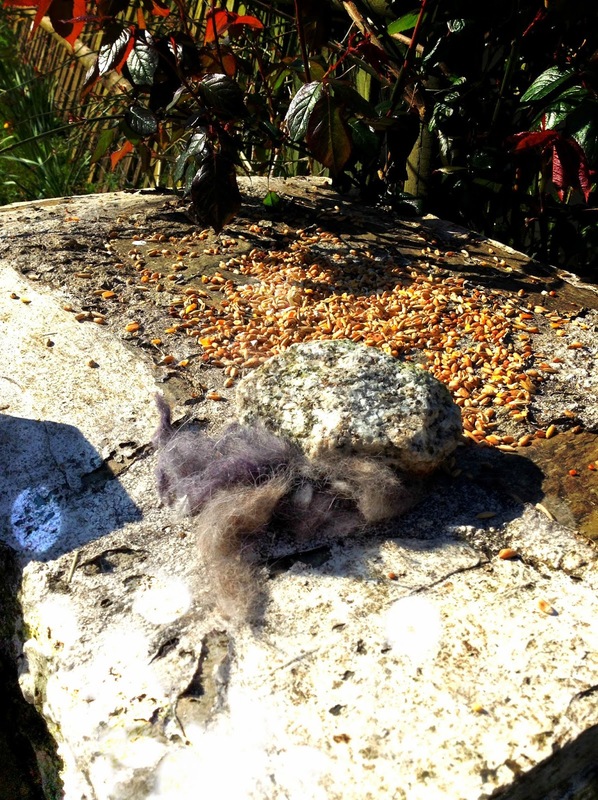 I wedge it half under a rock to hold it in place and when the birds come to get their breakfast, they usually leave with a beak-full of soft fur to line their nests with. I love watching them. Not a brilliant picture I know but it was very bright this morning and I couldn't see a thing on the screen. I have also now bought my first veg plants of this year. I have been giving some very careful consideration to what I'm going to grow this year because, as I live on my own, growing things like big lettuces and big cucumbers seems such a waste. I never manage to eat a whole lettuce but I absolutely hate to throw things away. So, I have come to the conclusion that growing things that I can harvest and freeze if there is a glut, like carrots and cabbage and cauli and stuff is fine but things like cucumbers, lettuce and easily perishable things need to be things that I can eat in one or two sittings, better yet, they need to be things that I can pick and eat as I need them. So here are some of the things I'm hoping to grow this year. Cut and come again salad leaves. And whatever else I can squeeze into my little raised beds. I also like to grow things in big pots and tubs because I can stand them off the ground and keep some of the evil, plant munching slugs and snails away from them. I would also love to grow things like squashes and pumpkins but I don't really have all that much space so it's not something I have ever grown before. 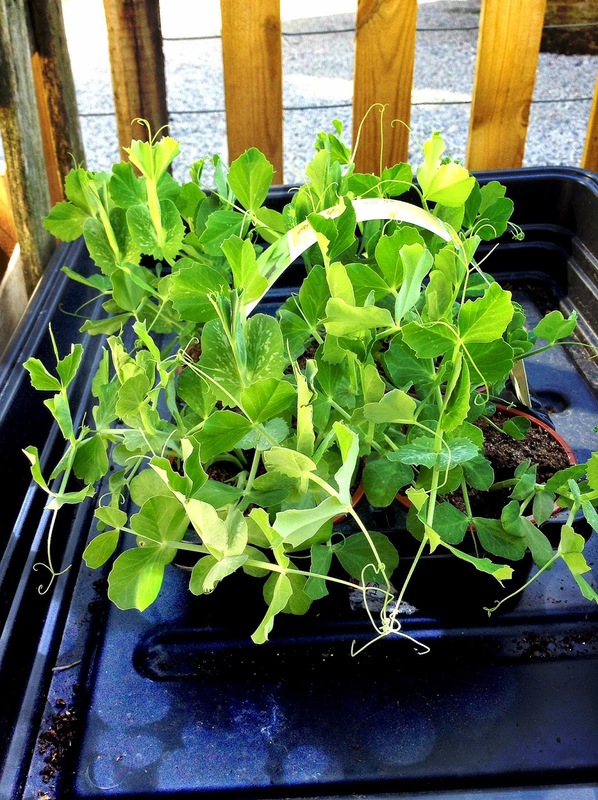 Anyway, here are the first of this years plants ..... some sugar snap peas. Will any of you be growing your own veg this year and if so what will you be growing? We grow lettuce and peas till it's too hot for them, tomatoes, green peppers, beans (green and broad) and potatoes. So far all are doing well, but we've had way too much rain, hoping for some sunshine. We had a lot of fun growing tomatoes, scotch bonnets, banana peppers, courgettes and lettuce last year. It's the first time I've had a greenhouse and I've gone rather overboard with the seeds I've bought - I blame those alluring colour catalogues. Lots of flowers, lots of veg and salad seeds, but there's very little space in my garden to put any of them when they are ready for planting out! I want to grow some cherry tomatoes, but from young plants, not seeds; also some begonias, upright and trailing ones; strawberries and raspberries. And Shock! Horror! it has only recently struck me that once I start using the greenhouse, I need to be there every day - no going away with my tent for a few days, because the seedlings will cook! Aaarrrgghh! My greenhouse is full of tomatoes, cucumbers and trays of seedlings, the garden pots are either full or have a designated veg or flower getting ready to be planted. I always grow loose leaf lettuce and trays of cut and come again, then it is fresh every time. My cu's are Marketmore which are small and I will have enough tomatoes to feed half the village, I hope. Sadly I garden in southern California, so the dry weather and the watering restrictions have taken a toll on planting this year. I always keep a variety of herbs though, different heirloom tomato plants, arugala, artichokes, and I am trying new potatoes as well as three blueberry bushes which do have some ripe blueberries on them. We save shower water in a bucket especially for the vegetables, and try to deep water with that in rotation. I think peas and fava beans are out though as they need too much water and don't like the intense heat.